Palestinian people need our solidarity more than ever. As Israel continues to violate international law and human rights Palestinians have called for global protests. 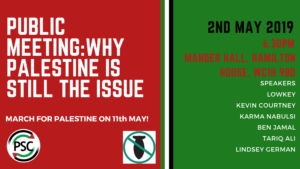 Hear from speakers from Palestine Solidarity Campaign and Stop the War Coalition about why you should march on Saturday May 11th 2019. As Israel continues to flout international law and violate human rights, there is a responsibility on the global community to hold it to account and push for an end to the oppression of the Palestinian people. No new Nakba! – End the siege of Gaza! – Defend the Right to Return!